Hundreds of thousands of pensioners have been swindled out of their hard earned retirement income, by corrupt officials in Sierra Leone, as the culture of impunity reigns supreme. 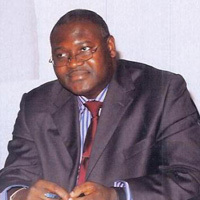 (Photo: Sacked pensions boss – Sam Bangura). It is estimated that between 2007 and 2013, politically appointed directors and senior officials of the country’s National Social Security and Insurance Trust (NASSIT), have misappropriated, embezzled, or mismanaged millions of dollars, meant to help cushion the financial hardship caused by retirement or death in service. With a pension age of 55 years, and average adult mortality at 47 years, thousands of people are dying every year in Sierra Leone, without earning a single cent from their pensions contributed into the state owned pensions investment fund, due to early death. Retired public sector workers that are lucky enough to escape death at 47 years, are struggling to get their pension and gratuity payments – if at all. NASSIT has become the private piggy bank of corrupt government officials. Families of deceased public sector workers are left in poverty, and are being denied of their legal entitlement to the pensions of their loved ones, as politicians and senior management of NASSIT continue to unlawfully raid the national state pension pot, for personal and political gain. 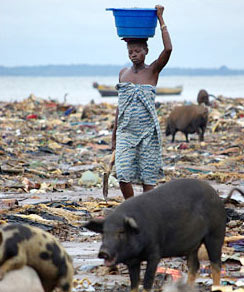 In Sierra Leone, about 4 million people out of a population of 6 million, are said to be living in abject poverty. Average daily income is approximately one dollar. And with hundreds of thousands of poor pensioners swindled out of their income by corrupt officials, the World Bank has stepped in with a $7 million grant, to help ameliorate the poverty created by the massive loss of pension funds. But will this $7 million get to the poor? The World Bank funding comes at a price. 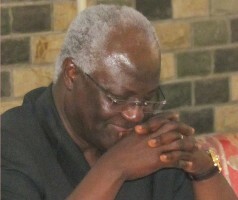 Koroma has been told to tackle rampant corruption in his government. The Sierra Leone Telegraph has learnt that the World Bank and other international aid donors, have called for a thorough investigation of the missing pension funds, and demanded that those responsible be held to account. Hence the reluctant decision last week by president Koroma to sack the entire senior management of NASSIT, including the director general – Sam Bangura – described by many as a ‘blue eyed’ patron of the ruling APC party, whose financial contribution to party funds is well recognised. The statement from State House was made public during the Easter weekend, when most people in the country would have been least interested in the politics of the day – another government shenanigan dubbed – ‘a good day to bury bad news’. 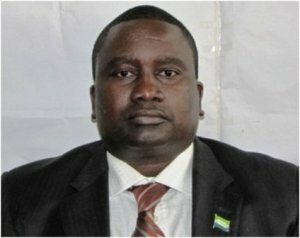 Although the sacking of Sam Bangura did not come as a surprise last weekend, what on reflection did surprise most Sierra Leoneans, was his appointment four years ago, following the sacking of his predecessor – Edmund Koroma – a cousin of the president and chief patron of the ruling APC party, who was found guilty of corruption. Sam Bangura was among a group of Sierra Leoneans that arrived in Sierra Leone in 2007/2008 from abroad, after the electoral victory of president Koroma to help deliver his Agenda for Change, and manage the affairs of state. But most of those called by Koroma from overseas to take up public office were his relatives, APC election campaign fund contributors, and ‘sons and daughters of party grandees’, with little or no experience in management. After working for London Transport in a back office administration role, with no senior financial management, corporate business or portfolio investment experience, Sam Bangura found himself managing the country’s multi-million dollars state pension fund. A recipe for disaster. But, this was a presidentially designed disaster, waiting to happen. It was not a matter of if, but when. The pensions boss and his cohorts have embarked on a pilfering rampage, raiding the meagre pension contributions of hundreds of thousands of poor people in Sierra Leone, throwing them into abject poverty. After many years of financial mismanagement, misappropriation and poor investment decisions, the Board of Trustees of NASSIT last year called Sam Bangura to account. But their efforts at instilling accountability, were thwarted by political interference from State House. In particular, the Board was very concerned about some of the investment decisions made by Sam Bangura, such as the transfer of thousands of dollars into the account of a company called West Africa Holdings. The money was meant for the refurbishment of Mammy Yoko Raddison Blu Hotel, and for the purchase of fixtures, furniture and fittings. Although work on the hotel has been completed and the hotel is now opened for business, questions still remain as to the transparency and financial probity of Sam’s so called investment decisions. It was reported last August that the Board of Trustees prevailed upon Sam Bangura to honour the terms of the performance management contract, signed between president Koroma and Sam – on behalf of NASSIT. The Trustees further strongly implored Sam to ‘ensure that the requisite management performance indicators criteria in Annex 111 are strictly adhered to’ as agreed. But there are other investment decisions that are now costing pensioners and contributors enormous loss of income, such as the funding of cement manufacturing in the country; funding of presidential flagship projects – including shopping outlets in various parts of the country, that are failing to add profits to the Trust’s revenue stream. Sam has also increased the Trust’s investments into luxurious and expensive private housing development, which is also costing pensioners millions of dollars in lost income. The average cost of one of NASSIT’s new built luxurious homes is $200,000, which few in Sierra Leone can afford. Hence not many are being sold to help recoup NASSIT’s investment. The Sierra Leone Telegraph has learnt that the venture is now running at a huge loss. With millions of dollars now missing from the country’s pension trust fund, it is not clear whether the Anti-Corruption Commission will prosecute Sam Bangura and his fellow directors of corruption. (Photo: Joseph Kamara – ACC Boss). Observers say that prosecution is highly unlikely, as Sam Bangura’s appointment in the first place, was politically driven. President Koroma appointed Sam, in order to placate the Bangura family for the state murder of his father – Bank of Sierra Leone governor, by former ruling APC party leader – Siaka Stevens in the 1970s. 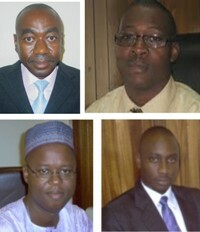 Three years ago, Sam Bangura’s predecessor at NASSIT – another ruling APC party blue-eyed financial patron – Edmund Koroma (Photo: Top left), was found guilty of corruption by the Anti-Corruption Commission, ironically, along with the now sacked Gibril Saccoh. “The Commission has now reached a decision on its investigations, in respect of the NASSIT Ferries (Bai Bureh and Masimera) Case File. But despite the gravity of that offence committed by the politically appointed fraudsters, president Koroma himself went on to commit another serious error of judgement, by allowing the deputy director – Gibril Saccoh to continue to run the Trust. Critics of the government say that the president’s lack of judgement, is costing the country immensely, and welcome the fact that this is his final term of office, as head of state. In 2009 Edmund Koroma and Gibril Saccoh purchased two ferries in Europe from a dodgy dealer, for use by the government to transport people and goods across Freetown to Lungi. But both ferries were proven to be unseaworthy, and the costs grossly inflated by the directors – at three million euros, plus other costs. Edmund Koroma and his fellow directors of NASSIT paid the fines imposed by the ACC, through another fraudulent and politically motivated out of court settlement, seen by many as a mere slap on the wrist. Edmund Koroma was subsequently rewarded by president Koroma, as though for his expertise in the art of malfeasance, and was appointed to the office of Financial Secretary to the country’s Treasury Department. President Koroma is now also expected to appoint Sam Bangura into another government department, where the mismanagement and misappropriation of public funds will no doubt continue with impunity. But it is not clear what will happen to ‘second time not so lucky’ – Saccoh. Will he be prosecuted again for corruption by the president’s cousin – Joseph Kamara, who is head of the ACC? And for how long will NASSIT continue to be regarded as the personal piggy bank of corrupt officials, while poor pensioners and their families continue to die of hunger?